Focusing exclusively on the notable alumni of Arizona State University, 2015 Panini Arizona State Collegiate is a multi-sport set that includes basketball, baseball and football subjects. Each box includes one autograph or memorabilia card. 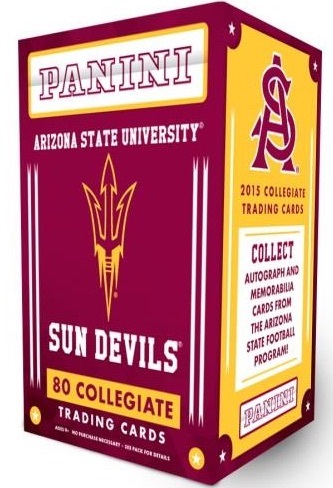 Featuring a 50-card base set, top Sun Devils are covered in the product. This includes James Harden, Byron Scott, Reggie Jackson, Jason Kipnis, Bob Horner, Jaelen Strong, Marion Grice, Jamil Douglas and Promise Amukamara, among others. The base set also offers Silver, Gold and Black parallels. Likely the top draw for fans and collectors, 2015 Panini Arizona State Collegiate includes Signature cards, with limited parallels that are numbered to 99 or less. In Honors, the primary insert, covers the award recipients. This includes athletes that were named the Pac-12 Player of the Year or Bronko Nagurski Trophy winners. In Honors Silver adds holographic foil. Although there are two different formats, the overall box guarantees are the same. Each hobby or blaster box yields one hit and three parallels. 2015 Immaculate Collegiate Ink Blue #4 Reggie Jackson Autograph #1 5 ARIZONA ST.
2015 PANINI PRIZM COLLEGIATE DRAFT PICKS HOBBY BOX 2 AUTOS WINSTON MARIOTA ?